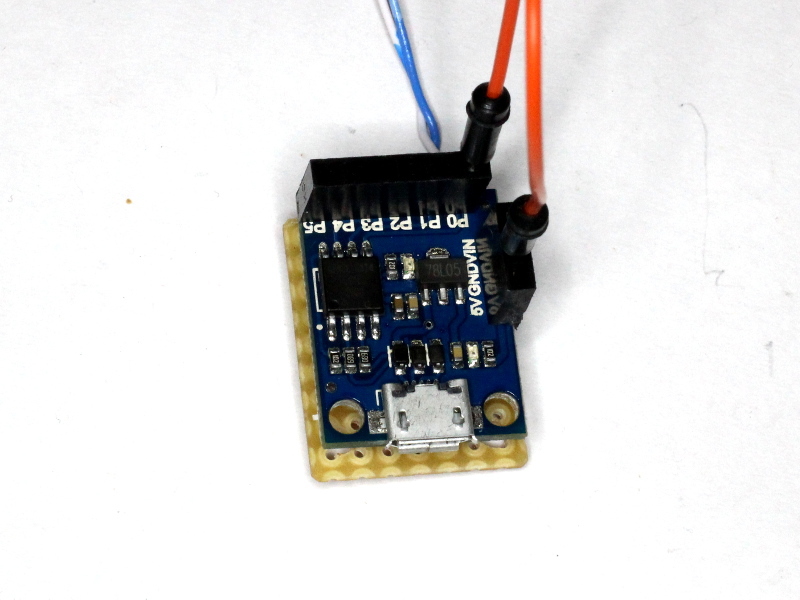 This project is a data logger accessory for Lou Destefano’s (VK3AQZ) RF Power Meter kit (RFPM1). The RFPM1 develops an analog signal 0-2000mV corresponding to 0-100dB input power range, -85-16dBm. 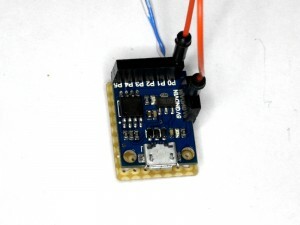 The module described here produces a digital output scaled -85.0 to 15.0 for 0-2000mV input. The Naze32 is hardly new, but it does seem to have reached a maturity where it, alternative firmware and the support tools are functional and fairly stable. The article describes a project to fit a Naze32 to an existing quadcopter that used a Multiwii flight controller on a Atmega 328P platform, and initial perceptions. The 32bit processor at 72MHz provides a lot more computing power than the old 8bit processor at 16MHz. An early decision was made to try Cleanflight as first option, as it appears to work well, is responsive for user issues, has a good PC client and is configurable from Arduino using the EZ-GUI client that I use for Multiwii. This Jan 2011 article has been copied from my VK1OD.net web site which is no longer online. It is for reference in further articles discussing the popular reflections explanations. The article may contain links to articles on that site and which are no longer available. VSWR will damage a HF ham transmitter, and the mechanism is that the ‘reflected power’ in a standing wave will be absorbed by the Power Amplifier (PA), increasing heat dissipation and damaging the PA.
At Transmission line loss under mismatch explanations I wrote that there is a lot of woolly thinking amongst hams about transmission line loss under mismatch and worked a simple example that could be done ‘by hand’ to show that formulas that some authors have produced as implementations of their explanations don’t stack up. I also gave a solution to the Zo*3 scenario using TWLLC, but not the Zo/3 scenario which a few eagle hounds have pounced on as evidence that the solution would not support the article. 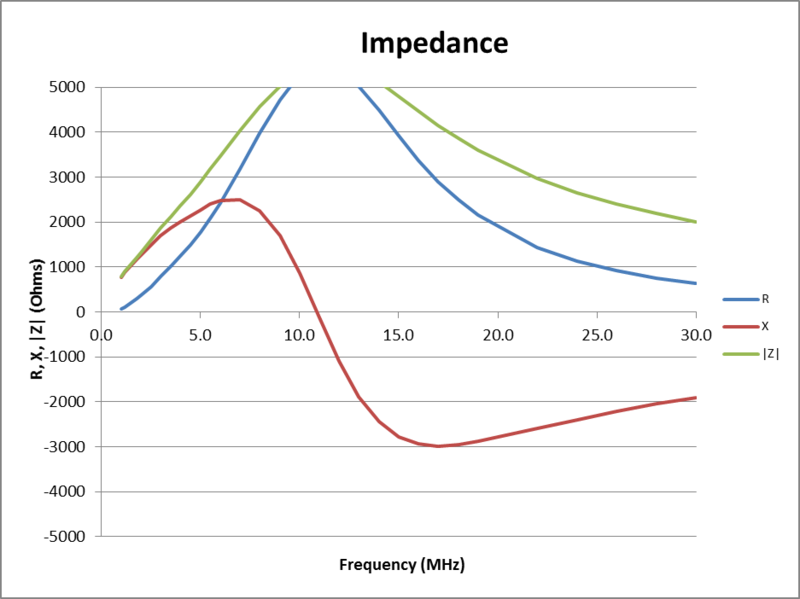 The power lost in a given line is least when the line is terminated in a resistance equal to its characteristic impedance, and as stated previously, that is called the matched-line loss. There is however an additional loss that increases with an increase in the SWR. This article describes an enhancement to the DIY USB password generator, a small USB HID keyboard device that types a password stored in EEPROM automatically when it is attached. This article describes an implementation of the DIY USB password generator. It is a small USB HID keyboard device that types a password stored in EEPROM every time it’s attached. 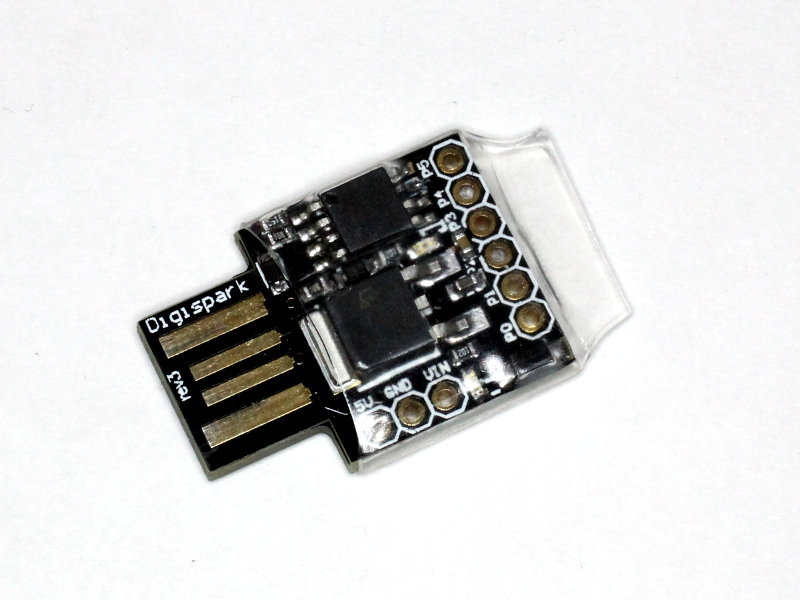 The implementation was on a Digispark ATTINY85 General Micro USB Development Board which was purchased on eBay for a few dollars. 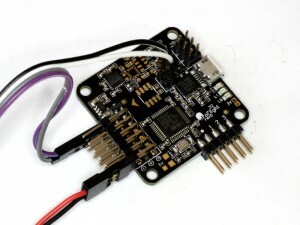 The board uses different pin connections to USB to the original, and requires a hardware jumper from D+ (PB4) to INT0 (PB2). In the process of changing the code, I updated the V-USB driver. That necessitated quite a few changes to source code. The updated code was compiled, and tested just fine. Changed / updated code (includes hex): usb_tiny85_passgen.zip. The Carolina Windom is very popular with modern hams, and at the same time is commonly the discussion of problems in online fora. The question is whether it is its popularity that is the reason for cries for help, or whether there is something inherently high risk in the ‘design’. The first type is the classic ‘original’ Windom with single wire feed which folk lore explains as a horizontal wire being tapped at a point where Z matches the vertical ‘single wire’ feeder, that there is not a standing wave on the feed line, and that it does not radiate. Traditional characterisation as a single-feeder Hertz denies the existence of the vertical radiating element. A correspondent asked about whether the proprietary copper clad VHF whips are some kind of marketing ploy. Lets consider a quarter wave whip for the 2m band. Made from 2.4mm stainless steel, it should deliver lowest VSWR(50) at about 483mm in length. The properties of stainless steel whips will vary, but lets consider the case of one made from 17-7 PH Stainless Steel, a quite tough material that is popular with manufacturers of mobile whips. 17-7 PH Stainless Steel has higher resistivity than copper, but worse, it is weakly ferromagnetic which affects RF resistance. Above is a calculation of the effect of skin depth, Rrf/Rdc is very high at 172, mostly a consequence of the permeability. In designing a Guanella 1:1 balun, selecting a ferrite core that has been characterised by the manufacturer simplifies the design process greatly. 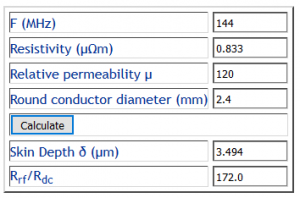 The manufacturer’s full characterisation includes curves for complex permeability vs frequency and from these the magnetising impedance of the core can be calculated. Note though that tolerances on magnetics are usually fairly wide and they can be quite temperature dependent. The inductor will usually exhibit a self resonance that is not revealed by the above calculation, but can be reasonably well modelled by adding a small equivalent shunt capacitance, see (Knight 2008). 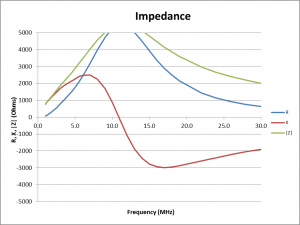 This equivalent capacitance is usually very important and not so easy to estimate, and is often best estimated by careful measurement of the self resonant frequency of the inductor (taking care to back out fixture effects). With experience, one can make a fairly good first guess so that the process is not too iterative. Some writers say that Cs increases as turns are increased, but (Knight 2008) shows quite the opposite. 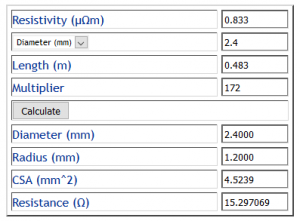 Controlling inductor self resonance is a lot about controlling added stray capacitance, eg connecting wires, encapsulation in conductive boxes etc.